HOW TO EASILY AND CHEAPLY DIAL INTO ONE OF MY TELECALLS! I run all my tele-calls and tele-gatherings via a fantastic service called Maestro Conference. They use US phone lines. This means you will need to dial a US phone number to participate in the call. 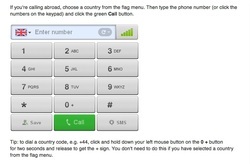 Here are some simple instructions for how to dial into the call easily and cheaply. ** Decide if you're going to dial in from an ordinary landline phone, a cell/mobile phone, or from your computer via Sype. You will be dialling a US number to join the Telecall, so you can dial in exactly as you would when you usually dial a US number - either using your home phone, a phone card, or Skype. Aussies, go to http://www.aussiephonecards.com.au/ to buy a phone card for less than 2c/min! Other nationalities, do a google search on "best phone card to USA"
You will need to buy "Skype credit". (To do this in Skype v 2.8, click on the "Help Menu", then click on "Buy Skype Credit"
You will need a headset to cut out background noise, and you may also need a microphone, unless there is one inbuilt in your computer. To make a call on Skype, click on "Call Phones" at the bottom left of the page. A telephone number pad will appear. To make a call on Skype, click on the Phone Icon at the top of the page. A telephone number pad will appear. When you dial in, a woman's voice will say "Please enter your pin code followed by the pound key". You will have received your PIN CODE by email when you registered for the call. The pound key looks like this: "#" (we call it the "hash key" in Australia) If you're calling from a computer you can press shift and "3" and that will give you the "#". STEP 4: ENJOY THE CALL!